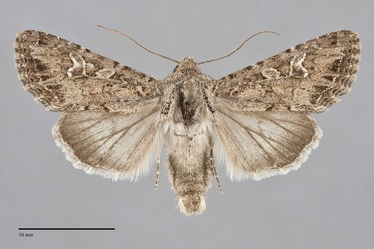 Sideridis fuscolutea is a medium-sized noctuid moth (FW length 16 - 17 mm) with gray-brown forewings with a pattern dominated by a white-lined boomerang-shaped reniform spot that flies in steppe environments in spring and early summer. The forewing color is lightest in the subterminal area and darkest gray in the terminal area. Dark gray is also present proximal to the subterminal line, interrupted by the ground color below the apex and along the veins M3 and CuA1 (simulating the usual W-mark typically formed by the subterminal line). The transverse lines are gray, double, filled with the ground color but indistinct except at the costa. The pale slightly yellowish brown subterminal line is even, forming a very weak W-mark toward the margin. The terminal line is series of dark spots between the veins. The fringe is weakly checkered with light and dark gray-brown. The outlines of the orbicular and reniform spots are thin and dark gray. The orbicular spot is oval and filled with light gray-brown peripherally and the ground color centrally. The moderately large reniform spot is lines with white, is asymmetrically boomerang shaped with a larger lower than upper portion, and is filled centrally with the ground color. The claviform spot is small and faint in most specimens. The hindwing is pale gray-brown, darker on the outer third, with darker discal spot and veins and a light whitish fringe. The head and thorax are gray brown with a gray band across the upper third of the collar and gray margins on the tegulae. The eye is covered with fine hairs. The male antenna is weakly beaded. 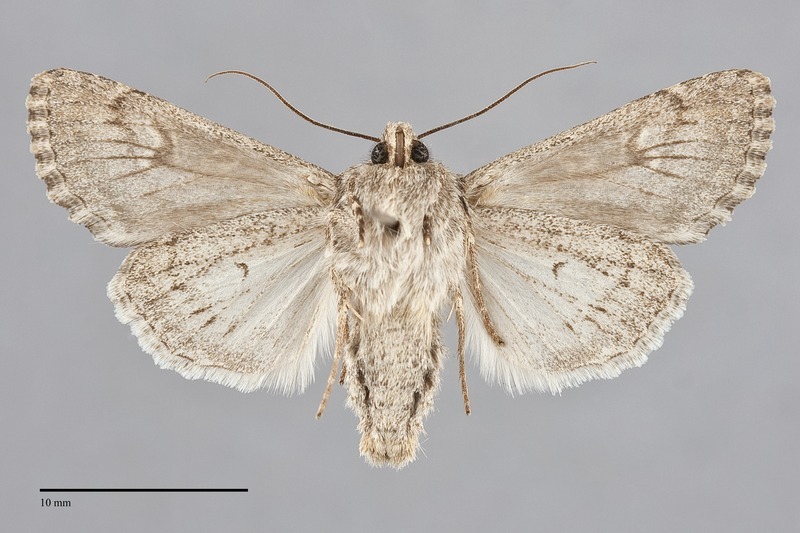 This species is most likely to be confused with several Anarta species with which it flies. It can be told from all of these species by the white inner line in the large reniform spot and the dark gray marks medial to the subterminal line. All similar Anarta species have dark reniform spots without a pale inner component, and have fewer dark marks on the distal wing. This species is widely distributed on dry sagebrush steppe at low elevations east of the Cascades. It is usually rare and sporadic, and appears to be most frequent in the Columbia Basin region. Sideridis fuscolutea is found in the dry interior of the Pacific Northwest as far north as southern British Columbia. It has been most frequently collected in the Columbia Basin of Washington and appears to be found elsewhere uncommonly. This species is found in the American West. The range outside of the Pacific Northwest is poorly known to us, but there are records from the Great Plains in Alberta and Wyoming and in the Great Basin in northern Nevada. This species is single-brooded and flies in the spring and early summer. Our records are from mid-April to early June. It is nocturnal and comes to lights.